The safe instant hand warmer that you can re-use hundreds and hundreds of times. To use, simply flex the disc in the liquid pad and the contents will crystallize at a safe preset temperature. To recharge, simply place the pad in boiling water for five to ten minutes to return the crystals to their liquid state, once cool the pad is now ready to re-use. This process can be repeated hundreds and hundreds of times. Before you go outside with your Thermo-Pad, heat it in a sink of hot water or place it in the microwave for 30 seconds at high heat. By doing this you can use the Thermo-Pad as it cools down while still in its liquid form and then activate it when it cools to provide heat again. 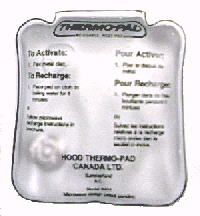 Keep the Thermo-Pad in your mitts or in a pocket to keep it from cooling too quickly. Hunting, Fishing, Boating, Golfing, Camping, Hiking, Skiing, Scuba Diving, Spectator Events, Working Outdoors, Anytime, Anywhere You Need HEAT ! !